Denny Hamlin put on an impressive display of driving Sunday at Martinsville Speedway, slicing through the field from the back twice to give the #11 FedEx Express Toyota a chance to win before an electrical failure in the master switch forced him to the garage for lengthy repairs and relegated the team to a disappointing 33rd-place finish in Round 7 of the 2012 Chase for the NASCAR Sprint Cup Series championship. Hamlin started fifth and overcame a pair of pit road speeding penalties in the first half of the 500-lap event on the half-mile track won by Jimmie Johnson. Both times, Hamlin was forced to restart deep in the field, and both times, the Virginia native masterfully picked off positions on his way to the front. Following a series of green flag pit stops near Lap 350, Hamlin was running third when he noticed the car losing power and cutting off on the track. After in-car attempts to remedy the problem did not work, the FedEx Racing team was forced to the garage to diagnose the situation. 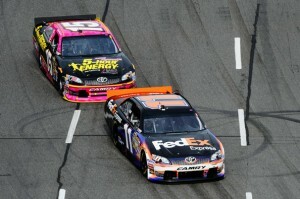 In the end, repairs cost the team 34 laps on the track before Hamlin returned to finish the race. The finish dropped Hamlin to fifth in the Chase standings following Martinsville, now 49 points behind new leader Johnson with three races remaining on the schedule.